The Oligocene Frio and Anahuac Formations were assessed as part of the 2007 U.S. Geological Survey (USGS) assessment of Tertiary strata of the U.S. Gulf of Mexico Basin onshore and State waters. The Frio Formation, which consists of sand-rich fluvio-deltaic systems, has been one of the largest hydrocarbon producers from the Paleogene in the Gulf of Mexico. The Anahuac Formation, an extensive transgressive marine shale overlying the Frio Formation, contains deltaic and slope sandstones in Louisiana and Texas and carbonate rocks in the eastern Gulf of Mexico. In downdip areas of the Frio and Anahuac Formations, traps associated with faulted, rollover anticlines are common. Structural traps commonly occur in combination with stratigraphic traps. Faulted salt domes in the Frio and Anahuac Formations are present in the Houston embayment of Texas and in south Louisiana. In the Frio Formation, stratigraphic traps are found in fluvial, deltaic, barrier-bar, shelf, and strandplain systems. The USGS Tertiary Assessment Team defined a single, Upper Jurassic-Cretaceous-Tertiary Composite Total Petroleum System (TPS) for the Gulf Coast basin, based on previous studies and geochemical analysis of oils in the Gulf Coast basin. The primary source rocks for oil and gas within Cenozoic petroleum systems, including Frio Formation reservoirs, in the northern, onshore Gulf Coastal region consist of coal and shale rich in organic matter within the Wilcox Group (Paleocene–Eocene), with some contributions from the Sparta Sand of the Claiborne Group (Eocene). The Jurassic Smackover Formation and Cretaceous Eagle Ford Formation also may have contributed substantial petroleum to Cenozoic reservoirs. Modeling studies of thermal maturity by the USGS Tertiary Assessment Team indicate that downdip portions of the basal Wilcox Group reached sufficient thermal maturity to generate hydrocarbons by early Eocene; this early maturation is the result of rapid sediment accumulation in the early Tertiary, combined with the reaction kinetic parameters used in the models. A number of studies indicate that the migration of oil and gas in the Cenozoic Gulf of Mexico basin is primarily vertical, occurring along abundant growth faults associated with sediment deposition or along faults associated with salt domes. The USGS Tertiary assessment team developed a geologic model based on recurring regional-scale structural and depositional features in Paleogene strata to define assessment units (AUs). Three general areas, as described in the model, are found in each of the Paleogene stratigraphic intervals assessed: “Stable Shelf,” “Expanded Fault,” and “Slope and Basin Floor” zones. On the basis of this model, three AUs for the Frio Formation were defined: (1) the Frio Stable Shelf Oil and Gas AU, containing reservoirs with a mean depth of about 4,800 feet in normally pressured intervals; (2) the Frio Expanded Fault Zone Oil and Gas AU, containing reservoirs with a mean depth of about 9,000 feet in primarily overpressured intervals; and (3) the Frio Slope and Basin Floor Gas AU, which currently has no production but has potential for deep gas resources (>15,000 feet). AUs also were defined for the Hackberry trend, which consists of a slope facies stratigraphically in the middle part of the Frio Formation, and the Anahuac Formation. The Frio Basin Margin AU, an assessment unit extending to the outcrop of the Frio (or basal Miocene), was not quantitatively assessed because of its low potential for production. Two proprietary, commercially available databases containing field and well production information were used in the assessment. Estimates of undiscovered resources for the five AUs were based on a total of 1,734 reservoirs and 586,500 wells producing from the Frio and Anahuac Formations. Estimated total mean values of technically recoverable, undiscovered resources are 172 million barrels of oil (MMBO), 9.4 trillion cubic feet of natural gas (TCFG), and 542 million barrels of natural gas liquids for all of the Frio and Anahuac AUs. Of the five units assessed, the Frio Slope and Basin Floor Gas AU has the greatest potential for undiscovered gas resources, having an estimated mean of 5.6 TCFG. The Hackberry Oil and Gas AU shows the second highest potential for gas of the five units assessed, having an estimated mean of 1.8 TCFG. The largest undiscovered, conventional crude oil resource was estimated for the Frio Slope and Basin Floor Gas AU; the estimated mean for oil in this AU is 110 MMBO. This is an electronic copy of Appendix 1 that contains data forms for conventional assessment units. 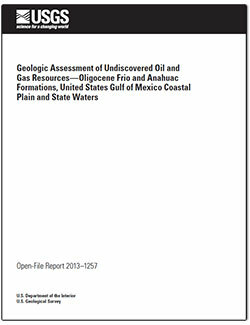 Swanson, S.M., Karlsen, A.W., and Valentine B.J., 2013, Geologic assessment of undiscovered oil and gas resources—Oligocene Frio and Anahuac Formations, United States Gulf of Mexico coastal plain and State waters: U.S. Geological Survey Open-File Report 2013–1257, 66 p., http://dx.doi.org/10.3133/ofr20131257.